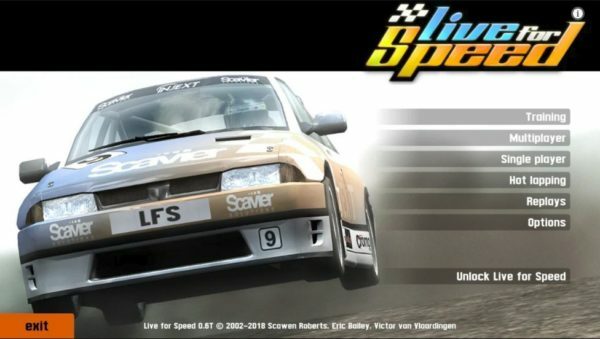 Live For Speed, a online racing simulator, now can be installed in Ubuntu 16.04, Ubuntu 18.04, and higher easily via Snap package. The forces affecting the car’s motion are simulated individually at each wheel. We recommend the use of a steering wheel, because although you can use the keyboard and/or mouse, a wheel and pedals provide a lot more accuracy. The force feedback sent to the steering wheel is calculated directly from the forces, with no canned effects. This allows you to feel what is happening at the contact patch between your tyres and the road, helping you to get closer to the limit without exceeding it too much! Thanks to Taqi Raza, you can now install LFS in Ubuntu via Snap package, which is built against Wine platform. To install the simulator in Ubuntu 18.04 and higher, simply search for liveforspeed in Ubuntu Software. and then install live for speed. Once installed, launch the software from application menu. For the first time, it sets up wine environments and installs the racing simulator automatically.